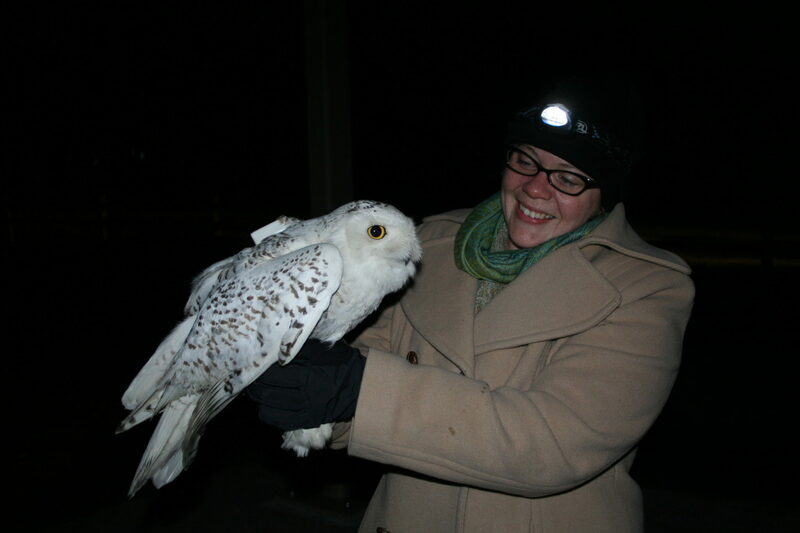 I was really excited to be in charge of trapping snowy owls in Delaware. I needed to place two transmitters sponsored by the Delmarva Ornithological Society, but I just wasn’t having any luck. Several trips, zillions of miles on the car, hundreds of dollars in gas. I visited many places where owls were reliably spotted for days on end to find they just weren’t there that day. Or the weather didn’t cooperate. Attempts to trap and relocate owls at Dover Air Force Base were unsuccessful because the owls were not interested in the traps. 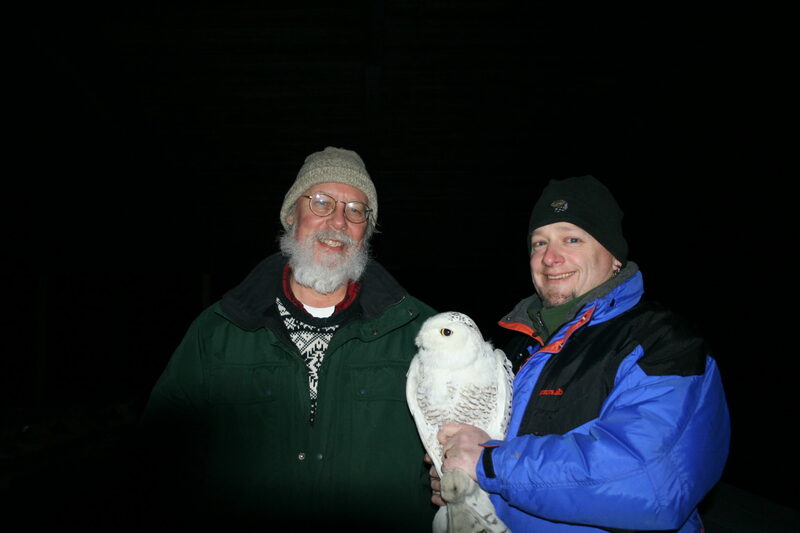 Scott came out once with David Alexander, an experienced trapper from Minnesota, only to be ignored as well by the owls in Dover. It seemed as though there was a curse on the Delaware effort. Had I committed some sort of trapper’s sin with my success at the New Year? I knew it really wasn’t a curse. The owls have probably been moving around with the cold weather. Ice on bays and rivers have their prey moving and they must follow. Some are probably sitting out on the ice, closer to food and farther from people, in an environment that feels a bit more like home. I suspected many of these “regulars” may actually be a number of roaming owls that keep moving between a few spots with good habitat, bumped from place to place by other owls. The snowies at Dover may also have been too well fed to be interested in the morsels I presented (and they may be wary from an earlier harassment campaign designed to convince them to leave the base). Whatever the reason, I was about to give up. 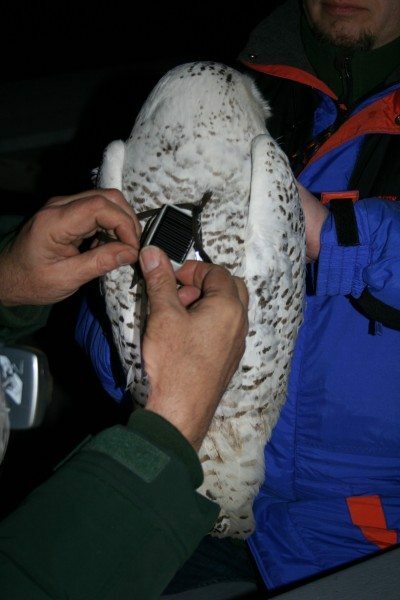 Any owl near Delaware was now a candidate for these transmitters, as they needed to be deployed before the snowies depart for the far North in a month or two. Last Sunday, feb. 9, I had the pleasure of speaking to the Sussex Bird Club in Lewes, Del., about my work with Project Owlnet and Project SNOWstorm. Dave Brinker was headed east for a week of trapping at nearby Assateague Island so we met after my presentation to exchange gear. 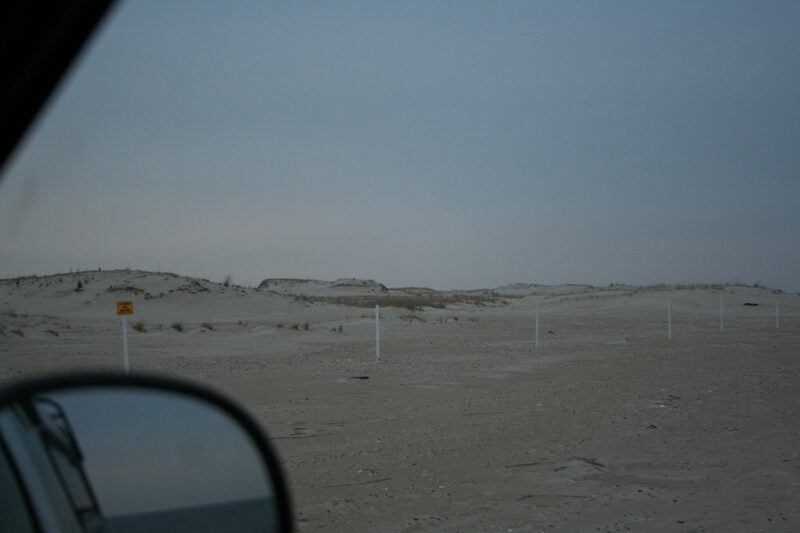 On a whim we decided to drive out on the beach at nearby Cape Henlopen State Park, even though no snowy owls had been recently reported there. …but that terrible curse still plagued us! Gear which had been passed through several hands and not used since the last trapping expedition was in disarray and missing pieces. We made quick repairs and returned to find the owl flying off with a Canada goose carcass. Dave gave quick instructions as I walked off to set the trap, “The radio control is turned off, don’t forget to turn it on!” Dave then left to try to chase the owl off the carcass so we could use it as bait. I set the trap and walked off. Fortunately I didn’t get too far before remembering to turn the trigger on and ran back and flipped the switch before returning to the truck. Dave, now carrying the goose, placed it in the trap — which sprung by accident, hitting him in the head. Fortunately Dave has a thick skull, and neither he nor the trap frame was injured. Finally all was set and we did not have to wait long for the owl to reclaim its meal. It landed at the edge of the trap, eventually moved to the center and bent down for a bite of goose. We pressed the remote trigger release — and pressed it again, and again. Nothing happened. Apparently the trap had been turned on before I walked off with it, and I had actually turned it off. Darned curse! Dave walked out to reset the switch, and the snowy flew off out of sight. Curses! Foiled again. 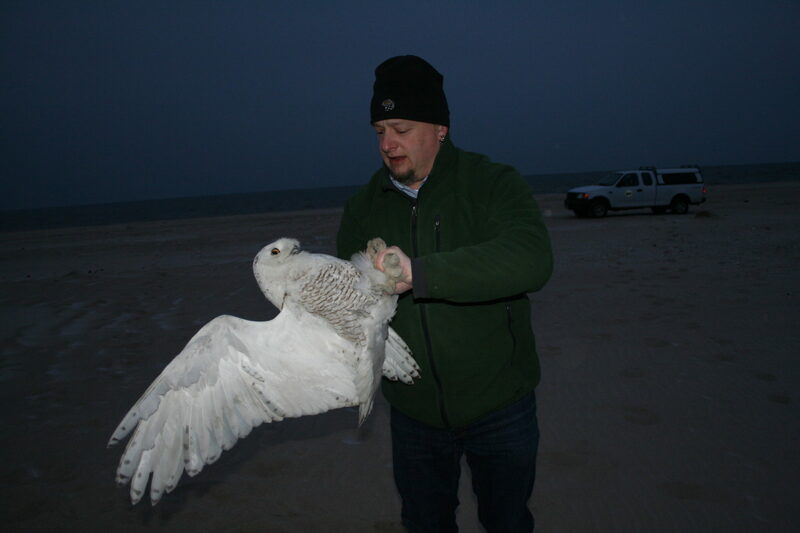 Dave wandered off into the dunes to see if he could relocate the owl while my wife, Katie, and I watched the trap. That’s when we noticed the owl, sitting on a high dune watching the trap. It had probably been there all along and Dave was headed right towards it. At this point things finally began going our way. Despite poor cell reception I reached Dave on his phone, warning him away. Soon the owl was back on the goose; the remote worked, and the owl was ours! Big smiles and high fives all around. I eventually remembered to call Dave and let him know he could come back from hiding in the cold dunes. Ironically Henlopen was the 13th owl to receive a transmitter. Lucky 13. The transmitter wasn’t scheduled to check in until the 11th, but when it did we had a beautiful set of points. It looks like the owl returned to its goose before heading around the Delaware Bay. It hopped up the coast, stopping at many of the spots I had visited following up on owl sightings, then crossed the top of the bay into New Jersey. The last GPS location was very close to where our first owl, Assateague, made his initial stop in New Jersey back in December. I’m excited for the next set of points. And for my next owls. 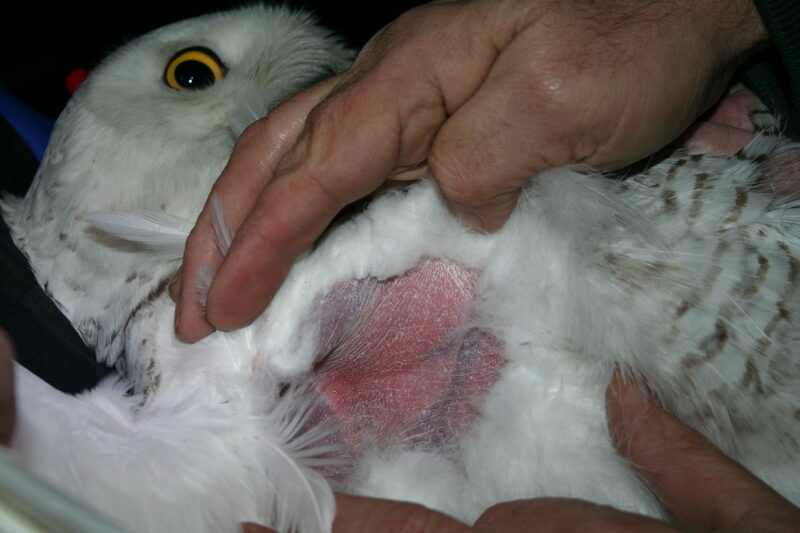 Fat is visible through the translucent skin of the owl. The lighter area is a large fat deposit, the dark is muscle. This owl has been eating well. Katie Glover is about to release Henlopen. I give the best Valentine’s Day presents! He was very smart to circle back to the Point for his goose. After going through all of that, he at least got to get his prize meal. And, Katie’s smile says that you do give the best Valentine’s day presents! Well done! Keith – I’m not at all surprised the owl went back to its goose. As Dave carried the goose to the trap, I thought the owl might go after him. It was leaning forward and looked ready to launch in his direction at any moment. Such a great job you did! I wish I was closer…I love these cute creatures.